This review focuses on Go! Focus Vitamin Supplement. According to the information from the company’s website, this product contains a mixture of elements that have numerous benefits to users. The product can improve heart function, immune system, nervous system, as well as maintain energy levels in the body. You will learn more about this product as you read further. Flaxseed oil contains Omega 3 oils believed to improve brain function. The compounds contained in extracts of Ginkgo biloba also play an important role in enhancing brain function. Vitamins B6 and B12 are known for their role in improving brain functions, as well as the functions of the nervous system. In general, all B vitamins included in the product assist the body to convert food into energy. Based on the roles of these ingredients, it is evident why the manufacturer claims that the product is good for the brain, the nervous system, and for sustaining energy levels. Each bottle contains 60 tablets. It is recommended that users should take 2 tablets with one glass of water every day after breakfast. Therefore, for a single user, one bottle lasts for 30 days. According to the directions of use, this dosage is for adults who are 18 years and older. The manufacturer warns users against exceeding the recommended dosage. The company also advises users with known allergies and sensitivities from using the product. The flaxseed oil and grape seed extracts contained in the product may also affect people who use anticoagulants and anti-platelets by causing blood thinning. Users suffering from diabetes should use the product with caution because some ingredients may interfere with blood glucose levels. This supplement costs $9.20 on the company’s website. This price is for a single bottle of 60 tablets. This price is relatively cheap and may cause users to raise questions about the quality of the product and the ingredients used by the manufacturer. Although the product description seems to be captivating, there is no evidence of any guarantee based on the information acquired from the manufacturer’s website. The absence of a guarantee raises several concerns as to whether the product can do what the manufacturer claims. Users may also be concerned about what they should do if the product fails to meet its purpose. Additionally, there are no user reviews for the product to show what consumers think. Go! 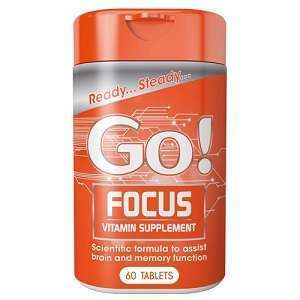 Focus Vitamin Supplement is an ideal product for people who need an affordable vitamin supplement. The product contains a wide range of active ingredients making it the perfect product for people who want to boost their heart function, immune system, and nervous system. This product is also affordable due to its low price. However, the lack of a guarantee and the low price raise concerns about the quality of the product. Furthermore, this may not be the ideal product for persons with allergies and sensitivities. Henry Costa	reviewed Go! Focus	on June 14th	 and gave it a rating of 2.5.